I was only three years old when the Alien sequel was released in 1986. I don't understand the chronology of the toys as they relate to the movies, but I very distinctly remember collecting Kenner's Aliens toys. According to a quick Google search, the Kenner line was released in 1992--six years after the movie debuted in theaters. It always bothered me that the figures were only loosely based on the characters from the movie. Bishop, in particular, looked completely different from his movie counterpart--with his his segmented metal helmet and glasses. I suppose the Kenner design made for a more interesting action figure, but honestly, I was more fascinated with his huge gatling gun than his shiny headpiece. Kenner's Aliens toyline was populated with plenty of aliens for the Space Marines to tangle with, but just like the heroes, the aliens did not resemble their movie doppelgangers. It wasn't until a later Alien vs. Predator set that we finally got a screen accurate alien from Kenner. Despite the liberties taken with the design of the monster, the toys were undoubtedly a lot of fun. The idea was that the alien would take on the form of the species the facehugger had infested. There were bull aliens, scorpion aliens, kill crab aliens (seriously!). My favorite was the gorilla alien. Probably because he most resembled the movie alien, but his acid (water) squirting action feature didn't hurt either. 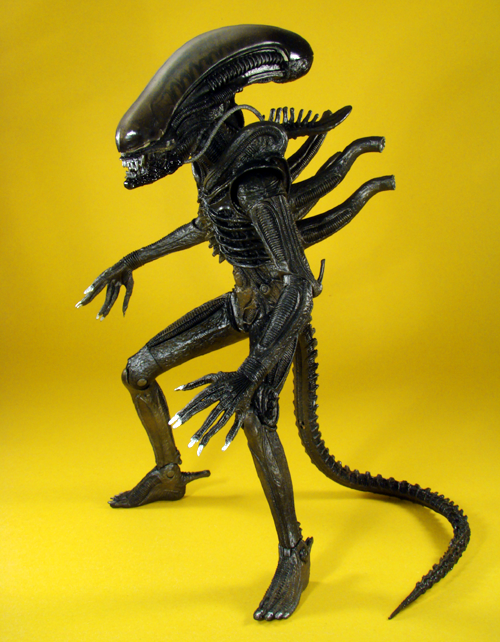 The alien pictured above is not made by Kenner, but NECA. It was part of a special Alien vs. Predator two-pack exclusive to Toys "R" Us. The detailing on this figure is incredible. We never get a clean look at the monster in the movie, so it's a treat to hold a replica of the creature in your hands; being able to spin it around and examine each and every tiny detail. The alien's jaw is hinged and there is an extending mouth mandible hiding within. The tail is bendy and is a tremendous help with posing the figure. There's just so much packed into the figure that I can almost overlook the lack of a water squirting feature.